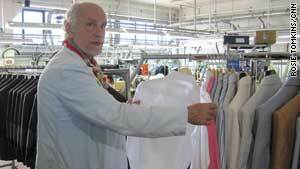 John Malkovich at the Bianconi factory in Italy where his clothes are manufactured. London, England (CNN) -- John Malkovich is used to people circling him. Whether it's fans asking for an autograph or reporters pressing for a quote, the actor's public appearances rarely pass unnoticed. However, there's one place where he becomes just one of the crowd -- when he's picking out fabrics at a fashion fair in Paris. At the Premiere Vision fair in Paris, the Hollywood star can be found among fashion industry professionals, hunched over fabrics, handpicking which ones will make it into his clothing line for men. Malkovich, well-known for starring in movies such as "Dangerous Liaisons" (1988), "Burn After Reading" (2008) and, of course, "Being John Malkovich" (1999), is carving out a new career as a fashion designer. "I've always had an interest in it and always loved doing it," Malkovich told CNN. "I like design, I like details, to me it is just another form of self-expression." For Malkovich the fabric fair is his idea of heaven. He is there to pick new materials for his second line of casual menswear, "Technobohemian," which he describes as "part of a concept to try and make art and surround yourself with art." He hungrily examines textile after textile as he looks for fabrics that could use in the collection, his face lighting up every time a new material catches his eye. "I'm a little bit of a fabric lunatic," he admits, "so I could wander around this place for years." Unlike some other celebrities, whose involvement in their respective fashion ventures is limited to just lending their names, Malkovich evidently participates in every stage of the process, despite his heavy filming schedule. "I design everything and do all the sketches and choose all the fabrics," he says. The maverick actor acknowledges that this might not be the best time to start such a business venture, but refuses to let the current economic climate hamper his pursuits. "It is a tough time right now, fashion-wise. There is not a lot of people throwing money at new clothes. But I love that work, it interests me in itself." Malkovich's involvement with the world of fashion is nothing new for the dandy actor. He's modeled for Yohji Yamamoto, Prada and Comme des Garcons and has directed short films for his close friend and fashion designer Bella Freud. He studied costuming and has collaborated with costume directors throughout his movie and theater career. His penchant for fashion took a new turn in 2002 when he launched his clothing company, Mrs Mudd -- a "sister" to his movie company, Mr Mudd. At first, his creations were available only to a select group of friends, including Johnny Depp, Spike Jonze and Javier Bardem, but later they became available to the wider public. For his first menswear line, dubbed "Uncle Kimono," the actor claimed inspiration from a series of unconventional characters, such as the Taliban's former ambassador to Pakistan, Abdul Salam Zaeef: Malkovich sketched a Mullah-style, long coat after hearing that Zaeef had been exiled for "wearing his turban too fashionably." "Generally, I come up with a name that has something to do with what gave me the impulse to draw it," he tells CNN from his company's headquarters in the fashion town of Prato, Italy. It's here that Malkovich's sketches become a reality. "Working with him is very easy because he has precise ideas," says Riccardo Rami, his partner at the fashion venture. "And if things need to change, he always adapts to the situation easily." But his flair for fashion does not necessarily translate to a sense of ease within the industry. "Do I feel comfortable in this world?" he asks. "No, not really. But you could probably say that about me in any world. See, if I could just do the work and not ever have anything else, I'd be very happy."